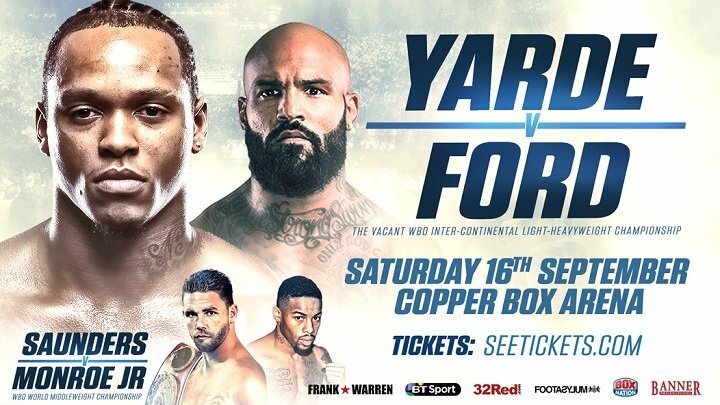 Ryan Ford says he won’t be intimidated by Anthony Yarde when the undefeated rivals square off for the Vacant WBO Inter-Continental Light-Heavyweight strap at the Copper Box Arena on September 16th, live on BoxNation and BT Sport. Ford, 35, racked up 22 wins during his successful 10-year mixed martial arts career, and now the 12-0 Canadian is determined to prove he is the ‘Real Deal’ in the boxing ring by inflicting a first career defeat on Yarde. Rising star Yarde (12-0, 11 KO’s) will pose the biggest challenge in Ford’s career to date. The Ilford powerhouse is quickly making a name for himself as one of the hottest talents in British boxing but Ford isn’t buying into the hype. “He’s a proven fighter in the UK, and a lot of people are saying ‘who is this guy he’s fighting next?’. People don’t know me over there, but I can guarantee that on September 16, people will know me. I’m coming to win that belt. “He’s got 11 knockouts. It will be by far my toughest challenge in the boxing ring, but I believe I will be his toughest challenge too. Yarde has never fought anyone like me. WBO Middleweight World Champion Billy Joe Saunders makes the second defence of his crown against Willie Monroe Jr in the evening’s main event; teenage Heavyweight sensation Daniel Dubois takes on AJ Carter for the Vacant Southern Area strap in only his fifth contest; knockout artist Joe Pigfordtakes on Kieran Smith for the Vacant WBO European Super-Welterweight title. Some of the very best up-and-coming prospects in the country including Welling Super-Featherweight Archie Sharp; Ilford Super-Bantamweight Lucien Reid; Fulham Super-Middleweight Zak Chelli and Erith Flyweight Jake Pettit feature. Ilford Welterweight Hamza Sheeraz; Tamworth Light-Heavyweight Ryan Hatton and Ilford Super-Middleweight Umar Sadiq all make their highly-anticipated pro debuts.